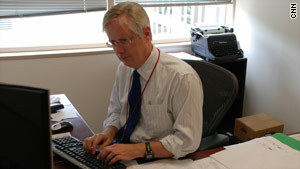 CNN's Tom Foreman says he may never stop writing to the president, whoever the president may be. (CNN) - Not long before he took office, President Barack Obama said something I am sure he now regrets. "There are a lot of people who seem to think they know how to run this country. I hope they'll let me hear from them." At least I think I remember him saying something like that. Anyway, it was a huge mistake, because I have now written 600 letters to the White House. One every day since he was inaugurated. It started as a joke. I thought the idea of sending armchair advice to the Leader of the Free World was funny and my first letter was really little more than congratulations. But after I posted letters on the "AC360" blog for 10 days, a lot of readers liked them, so I extended the string to the first month. Then the first 100 days. Then 200. And now, I have written enough to fill two books. And yes, I am aware that this can look like either dedication or mental illness, depending on your point of view. AC360° Web Exclusive: Is al Qaeda growing or weakening? Reporter's Note: President Obama said long ago that he enjoys getting advice from the public, and I took him at his word. So on this, the 600th day of his presidency, I am once again writing a letter to the White House. If he has changed his mind, I’m hoping he’ll let me know. An astonishing thought came to me as I was reading the transcript of your big news conference today: There are children in school now, who know how to read and write, to add and subtract; who enjoy soccer, act in plays, take piano lessons and participate in science fairs that were not even born when 9/11 happened. For them it is, and will always be, an item from the history books. Like World War One is for our generation. I can’t speak for you, of course, but that kind of blows my mind.